According to the American Cancer Society, Kombucha tea is made by fermenting sweetened black tea with the "Kombucha mushroom," which is not actually a mushroom at all but a mushroom shaped culture of yeast and bacteria that forms while the tea is fermenting. There are many variables that can occur when fermenting and consuming the tea with potentially dangerous results. Strains of molds, bacteria and fungi can develop which may cause serious illness. In fact, WebMD states on its website that 20 people in Iran developed anthrax infections after drinking kombucha tea. They go on to caution that the tea can be especially threatening to people with HIV or compromised immune systems. The Center for Disease Control (CDC) provided a report that lists case studies of individuals reacting badly to kombucha tea. In 1995, cases of unexplained illness, including one death, occurred in two people who drank kombucha tea for two months. Overproduction of yeast can occur in the tea due to fermenting at too high a temperature, using a kombucha culture that contains a high yeast to bacteria ration, or allowing the culture to remain dormant too long before use. WebMD lists yeast infections as a possible side effect of kombucha tea. Kombucha tea contains a high level of acidity, and this may cause problems for people with stomach ulcers, heartburn, or any sensitivity to acidic foods. Although some people claim that the 'good bacteria' found in kombucha can help those conditions, others find it aggravates them. Many people brew batches of kombucha tea at home, so one of the main reasons for kombucha danger is the use of equipment that has not been properly sterilized. When kept completely sterile, the bacteria in the kombucha culture is generally safe for consumption, but the introduction of harmful bacteria or the development of dangerous fungi can happen easily during the brewing process. Harmful bacteria and fungus can be found in anything from the jars used to brew kombucha to funnels and measuring equipment used in the blending of ingredients. Dr. Weil indicates there is particular concern about the fungus Aspergillis which has been found in some batches of kombucha tea. This toxic fungus causes serious lung infections, especially in immune-compromised people. Another thing to keep in mind is the material that the brewing containers are made of; some metals (like aluminum) or ceramics that contain lead can leach dangerous chemicals and bacteria into the tea as the fermentation is taking place. A PubMed abstract discusses two cases of lead poisoning in a couple who drank kombucha tea for six months that was brewed in a ceramic pot. Contaminated equipment poses a serious kombucha danger. Reactions to the resulting tea range from mild to severe, and can even be fatal. Despite the potential dangers, people still consume kombucha tea and are convinced of its health benefits. And since studies show the tea has detoxification, energizing, anti-oxidation and immune boosting effects, the tea is likely to remain popular. But as indicated above, drinking kombucha tea is not without risk. 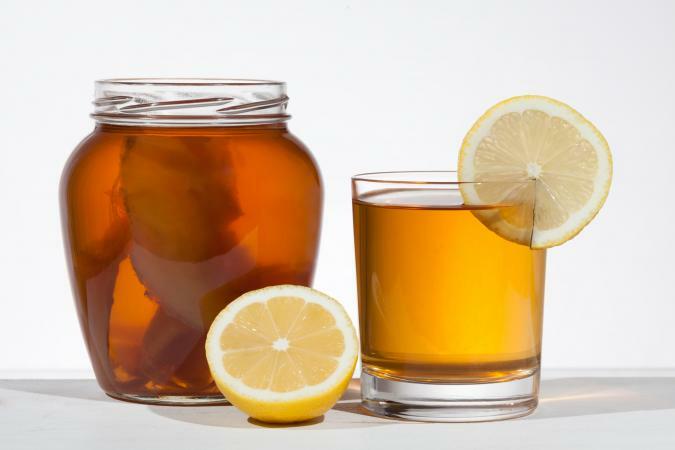 First and foremost, talk to your doctor to determine if kombucha tea is a safe option for you, especially if you take medications or have a health condition. Purchase bottled kombucha tea rather than making your own. If you decide to make your own kombucha tea, keep all work spaces and brewing equipment sterilized and dry. Follow brewing directions exactly, paying special attention to storage temperatures. Limit your intake to no more than eight ounces a day. If you experience any negative side effects or symptoms that you suspect are related to kombucha, consult your doctor immediately.